CLAIBORNE, William Charles Cole, (brother of Nathaniel Herbert Claiborne, nephew of Thomas Claiborne [1749–1812], uncle of John Francis Hamtramck Claiborne, granduncle of James Robert Claiborne, and great–great–great granduncle of Corinne Claiborne Boggs), a Representative from Tennessee and a Senator from Louisiana; born in Sussex County, Va., in 1775; moved in early youth to New York City; studied law in Richmond, Va.; admitted to the bar and commenced practice in Sullivan County, Tenn.; delegate to the State constitutional convention from Sullivan County in 1796; appointed judge of the superior court in 1796; elected as a Republican from Tennessee to the Fifth and Sixth Congresses, and served from November 23, 1797, to March 3, 1801, in spite of the fact that he was still initially under the constitutional age requirement of twenty-five years; appointed Governor of the Territory of Mississippi in 1801; appointed in October 1803 one of the commissioners to take possession of Louisiana when purchased from France and served as Governor of the Territory of Orleans 1804-1812; Governor of Louisiana 1812-1816; elected as a Democratic Republican from Louisiana to the United States Senate and served from March 4, 1817, until his death, before the assembling of Congress, in New Orleans, La., November 23, 1817; interment in Basin St. Louis Cemetery; reinterment in Metairie Cemetery. Papers: In Bertram Erwin Brown scrapbooks [188?-ca. 1919] containing original documents and Pickett's History of Alabama and incidentally of Georgia and Mississippi, published in 1851; Mississippi (Territory) governor executive journals (transcripts), 1805-1814; and Mississippi (Territory) commissioner to Louisiana Territory records (transcripts), 1804-1816. Originals of Mississippi governor and commissioner records in Mississippi Department of Archives and History. Papers: February 1, 1815. 3 letters. Introductions for Thomas C. Luckett. Papers: Correspondence in Pierre Samuel du Pont de Nemours papers, 1787-1817. Papers: Correspondence in Pierre Clement de Laussat papers, 1769-1815; and mentioned in Bartholomew Schaumburgh letter (1815) to Gen. James Wilkinson. Finding aid. Papers: 1800-1807. 6 items. Also correspondence in the Thomas Jefferson papers, 1606-1889, available on 65 microfilm reels. Finding aid. Papers: 1804-1815. 12 items. Correspondence, resolutions, political papers, and portraits. Papers: 1804-1811. Letters, letterbook (1804-1805), and an engraving (1810). Papers: 1801-1816. 12 volumes. Correspondence and a portrait. Papers: 1804-1814. 122 items. Chiefly his letters to and from the mayor and city council of New Orleans, together with city financial reports, itemized bills, petitions to the city council, and other papers. Papers: Signed commission (1806) of John Nancarrow in Williamson collection, 1770s-1958; and 14-page booklet on Claiborne from Mississippi Historical Society and biographical material in Melrose collection, 1700s-1948. Papers: 1800-1818. 19 items. Also correspondence in De la Vergne family papers, 1741-1971. Finding aid. Papers: Family correspondence in Mrs. W.R. Buffington collection, 1618-1864. 42 items, available on microfilm. 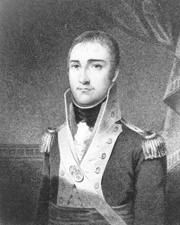 Hatfield, Joseph T. William Claiborne: Jeffersonian Centurion in the American Southwest. Lafayette: University of Southwest Louisiana Press, 1976. Winters, John D. 'William C.C. Claiborne: Profile of a Democrat.' Louisiana History 10 (Summer 1969): 189-210.